As many of you hopefully know by now, the Blue Line is in the midst of a comprehensive $350-million modernization project to improve reliability, enhance safety and improve the customer experience. The south closure, from Willowbrook/Rosa Parks Station to Downtown Long Beach Station, is happening now through late May and trains have been replaced by Metro bus shuttles. We’ve made some changes to the shuttle schedule based on ridership patterns observed over the last few weeks and feedback from customers. The service schedule below will go into effect starting Sunday, March 3. There are three types of Blue Line Bus Shuttles during the closure. • Blue Line Local Bus Shuttle Service (862) is free to ride, board using any door. 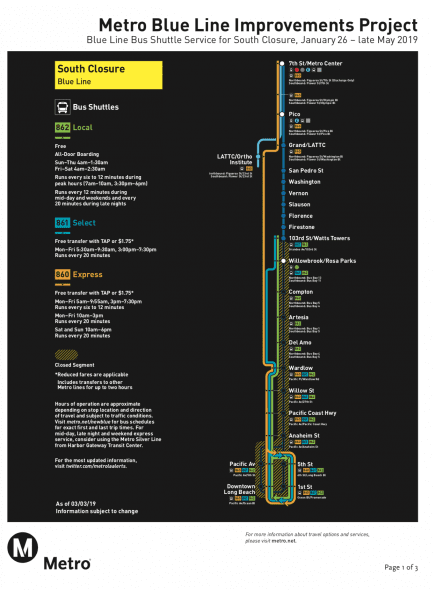 Buses serve all closed Blue Line stations. The shuttles will run the same hours as the Blue Line, seven days a week. • Blue Line Select Bus Shuttle Service (861) costs $1.75 to ride. It serves busier stations during the morning and afternoon rush hours. Customers with a valid TAP card can transfer for free to the Blue Line or other lines within two hours of starting a trip. 861 shuttles runs every 20 minutes Monday through Friday from 5:30 a.m. to 9:30 a.m. and from 3 p.m. to 7:30 p.m.
• Blue Line Express Shuttle Service (860) costs $1.75 to ride. It has limited stops between Downtown Long Beach and Downtown Los Angeles. Customers with a valid TAP card can transfer for free to other lines within two hours of starting a trip. 860 shuttles run every 6 to 12 minutes Monday through Friday from 5 a.m. to 9:55 a.m. and from 3 p.m. to 7:30 p.m. During midday buses run every 20 minutes. Buses run every 20 minutes on Saturday and Sunday from 10 a.m. to 6 p.m.
Not all the bus stops are at the rail stations — please see map with bus stop locations listed under each station. It will speed your trip to go directly to the bus stop. There will be signage at closed rail stations showing the way to the bus stops and Metro staff on hand to provide assistance. In addition to our three bus shuttles, we have alternative options. The Blue Line will continue running between 7th St/Metro Center and 103rd St/Watts Towers Station. Green Line service at Willowbrook/Rosa Parks Station will not be affected. • Late May through September 2019: Rail service will be suspended from the Willowbrook/Rosa Parks to 7th St/Metro Center and replaced by bus shuttles. The Blue Line will continue running between Compton Station and Downtown Long Beach Station. Red and Purple Line service will operate normally at 7th St/Metro Center. • During the northern closure, Expo Line rail service will be suspended for 45 days at 7th St/Metro Center and Pico Station with train service in that segment replaced by bus shuttles. Expo Line trains will continue to run between LATTC/Ortho Institute Station and Downtown Santa Monica. We will have exact date and time as we get closer to the northern closure. • Willowbrook/Rosa Parks Station will be closed for all eight months — until September. That will allow the station to be rebuilt with more capacity, a new customer service center and community plaza, easier connections to local buses and surrounding communities and upgrades to safety and security systems. During the closure, Green Line service will operate normally at Willowbrook/Rosa Parks Station. Work on the Blue Line will include improvements to the signaling system, tracks and the overhead wires that deliver electricity to trains. Four new crossover tracks will be built to reduce service interruptions. There will also be numerous station improvements, including new digital map displays, signage, paint and a refresh of the current landscaping. The Blue Line opened in 1990 and is Metro’s oldest rail line — modernization work has been ongoing since 2014 with a series of safety and operational improvements. For the New Blue project fact sheet and project team contact info, check metro.net/newblue. There is also a Frequently Asked Questions section that may be helpful. PLEASE add more buses to the Silver Line. The ride to and from downtown has become unbearable on most days. I don’t understand why Metro has not addressed the elephant in the room. Yes, I know that the Silver Line costs $2.50 to ride and regular buses are $1.75. This difference is fare hasn’t deterred a lot of people from switching to the Silver Line. Indeed, the Silver Line has been absolutely packed recently. If Metro can find a way to add buses now they may very well retain riders during and after the Blue Line closure. Several Silver Line commuters are now driving to work. If traffic wasn’t so bad on the 110 I would go back to driving as well. Metro should negotiate with Foothill Transit to eliminate the surcharge and charge $1.75 on this route. The video mentions an ‘op -ed’ article in the LA TIMES, entitled ‘Why I’m Breaking up with the Blue Line, after 19 years’. Where can I read this article? A year to again attempt to rebuild the Blue Line. It only took Henry Huntington six months to build the original line over the same right of way. Has the MTA turned to TONKA TOYS as their primary choice for construction equipment? Maybe a call to Orange Empire Trolley Museum or Travel Town could help with this long procedure. At least they are not text book so called professionals but instead have some practical experience which the MTA has shed itself of almost completely in it’s questionable history. Are there any updated PDF timetables for the new schedule for the 860, including the added weekday midday and weekend trips? The timetables are now available online and are linked in the article. Thanks! Is an updated PDF timetable for the 860 available with the new weekday midday and weekend trips available? That will be shared when it becomes available. what about adding some Artic bus on the Silver Line? It seems there is no problem running 60ft bus on both 10 and 110 fwy, although it could be difficult in the San Pedro area because the streets are narrow there. Instead just put some artic buses on route 910 only during peak hours would be a big thanks to all of us. And yes please remove the premium charge of the Silver Line, it DOES NOT WORTH FOR $2.5 per ride when the rest of Metro costs $1.75 to ride. Es ridículo durar 1 hora de la estación de lamo metro a la estación 1033 viajando en el bus, para poder interceptar el metro azul y llegar a los angeles algo más tienen que hacer. To paraphrase — and correct me if I’m translating wrong — Guillermo thinks it’s ridiculous that it takes one hour on the bus shuttle to reach the Blue Line’s 103rd/Watts Station and he wants Metro to improve the situation.